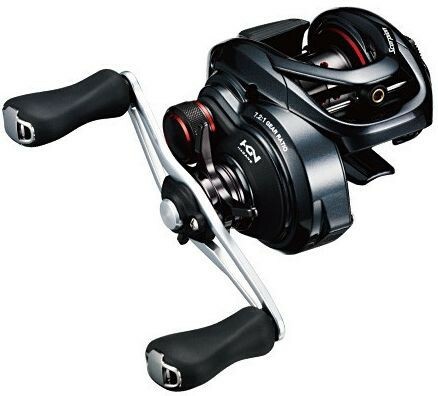 Shimano Scorpion 70/71 is the best value, high-performing small bait casting reel from Shimano Japan. It is built tough, with highly sophisticated casting components inside. Small sized Scorpions (2001 Scorpion 1000, 2009 Scorpion XT1000 ) have been the legendary secret in the U.S. bass tournaments since 2001, for its great casting performance, light-weight small palming body, and sturdy body construction. This new model has dial adjustable SVS Infinity brake system to offer the best casting performance. Scorpion 70, 71(lefty) has super-low sitting body, which is quite comfort for anglers with small palms. The small palming body helps accuracy in casting, as well for pitching and flipping. The light-weight, balanced spool accelerates fast and maximizes the casting distance. Improved SVS Infinity brake system allow you to choose the best brake setting by one click. Jun's Comment: This small Scorpion bait caster is the most valuable Shimano, for its super casting performance, durability, smoothness and affordable price. The small bait caster is suitable for both finesse and flip/pitching tactics. You'll surely love these reels.